All the following items are available for hire with a certificated, competent & experienced operator. 32t hooklift truck (with drawbar trailer to 44t GTW) with hooklift bins to 45 m3 (60 cubic yards) and plant flat with optional timber bolsters. Up to 16t payload. 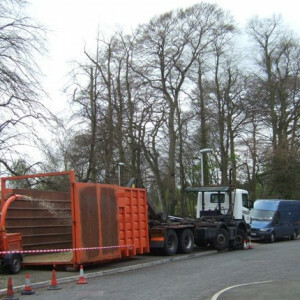 Whilst we regularly carry out specialist & sensitive operations, we also have the capability to undertake large pieces of work (see our Case studies). We work in close collaboration with main contractors to provide bespoke solutions adapted to individual sites or clients requirements.We are happy to provide all our services on a subcontract basis within Greater Manchester and the North West. This includes treework, woodland management & forestry, chipping, timber extraction, landscaping, and haulage. Our in-house haulage capabilities mean we are not relying on external hauliers to move our plant and equipment, and are therefore more reliable and cost-effective. You can find more information on our past work in our case studies. We welcome enquiries and suggestions from potential clients and partners. As a cooperative social enterprise, we believe in working together and sharing resources. Contact us now to discuss your hire/subcontracting requirements!